Grandparents and Special Friends’ Day is an annual event at The Fay School that offers a unique opportunity for generations of Fay supporters, friends, and families to learn and share all that The Fay School has to offer its students. This special event is held the Friday before Thanksgiving break and is always in conjunction with our annual Book Fair. The event begins with a reception with our Leadership Team in the Elementary Multipurpose Room. Grandparents and friends are then invited to join their grandchildren in the classrooms for a meeting and an activity. Students in Second- Fifth Grade will tour their visitors around campus showing off all the important stops! As a visitor, you will stop by our Outdoor Education Cabin, our Physical Education Play Space, Ms. Price’s Art Room, and more. 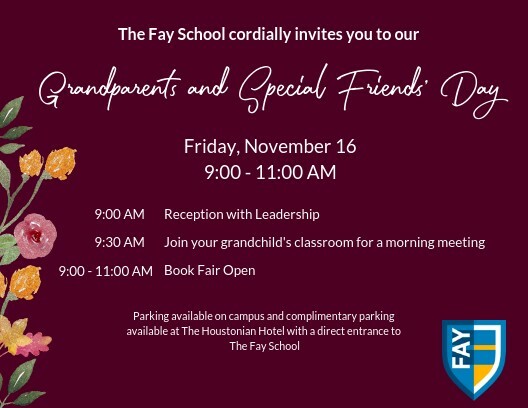 For additional information on The Fay School’s Grandparents and Special Friends’ Day, please contact Director of Advancement, Laura Dols. Donate a book to The Fay School library in honor or memory of a student, friend, or family member. Click here to fill out the form. Friends of the Library Donation forms can also be filled out at the Book Fair during Grandparents Day. If you can't make it to the Book Fair and would like to give funds to your grandchild to use at the Book Fair click here to fill out the form.